Wandering albatross chicks may consume up to 100 kg of food during their rearing period, which lasts for approximately 300 days. The human history of Heard Island and the surrounding waters is relatively short, with the first confirmed sighting of the Island in 1853, and the first landing in 1854. The next 50 or so years were not the most favourable in terms of environmental protection, with the primary activities undertaken ashore and in the seas involving the comprehensive and intensive harvesting of marine mammals, particularly elephant seals. 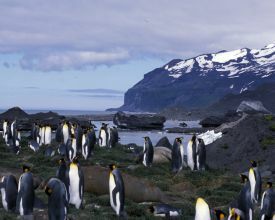 However, since the responsibility for administration and management of Heard Island and McDonald Islands was transferred from the United Kingdom to Australia in 1947, the enactment of legislation and the implementation of measures to ensure formal protection of the conservation values of the region has been a priority. The need for legally binding protection of the natural values of the Territory was formally acknowledged with the approval by the Australian Parliament of the Heard Island and McDonald Islands Act 1953 (HIMI Act) which, among other things, made provisions for the protection of wildlife and the making of ordinances for the administration of the islands. The Environment Protection and Management Ordinance 1987 (the EPMO), made under the HIMI Act provided a legal regime for the protection of the Territory’s indigenous plants and animals, including the obligation to prepare a management plan for the Territory and the requirement for a permit to enter or undertake activities in the Territory. The Heard Island Wilderness Reserve Management Plan, made under the EPMO, came into effect on 14 February 1996. The plan provided priorities for decisions that would affect the Territory, defined appropriate uses and activities, outlined management areas and contained management strategies for protecting the Territory’s values. In 1998 the HIMI region was identified in Australia’s Oceans Policy as one of five areas where the Australian Government would preferentially pursue a marine park, to ensure Australia’s temperate and subantarctic waters were incorporated in the comprehensive and representative system of marine protected areas and to help protect Australia’s unique marine biodiversity. The 65,000 square kilometre HIMI Marine Reserve was declared under the Environment Protection and Biodiversity Conservation Act 1999 (Cth) in October 2002. This declaration brings into effect the Commonwealth reserve provisions of the EPBC Act for the Reserve, along with those provisions applicable to World Heritage properties, listed heritage places, important wetlands, threatened and migratory species and Commonwealth marine areas. The controls on activities in the Reserve, and the strategies for managing the Reserve to meet the aims are detailed in the HIMI Marine Reserve Management Plan, made under the EPBC Act. Commercial fishing in the waters surrounding the Reserve and within the Australian Exclusive Economic Zone (EEZ) is managed by the Australian Fisheries Management Authority (AFMA) to ensure that harvesting in the Australian HIMI fishery does not impact on the values of the Reserve. Additionally, the Australian Government is committed to combating illegal fishing in the HIMI EEZ, and the region is the focus of growing national and international efforts to combat illegal fishing.